Before we watched Julia Child work her magic on “The French Chef,” or cheer on our favorite Iron Chef, there was radio. There are still some radio shows where chefs will talk about the latest food trends, and a recipe will be given out by Martha Stewart, but in days gone by, radio was the only way some rural residents could learn how to cook in a modern way. It came to be that the U.S. Department of Agriculture Bureau of Home Economics and the Radio Service created a character named Aunt Sammy, who was supposed to be the “wife” of Uncle Sam. Many different women of various radio stations across the country would play Aunt Sammy. The first Aunt Sammy was broadcast on NBC radio in 1926. The focus of the program was menus and recipes, although she also talked about other household matters. Aunt Sammy was very popular in the rural markets, and was said to reach 500,000 farm women. The broadcast was usually a 15-minute period, 5 days a week. 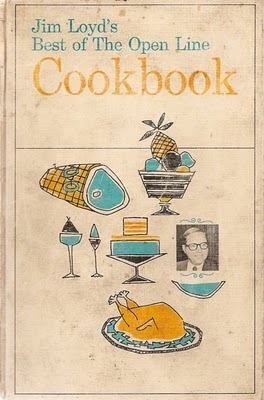 In 1927, the most popular recipes were assembled into a pamphlet, Aunt Sammy’s Radio Recipes. In 1932, it became the first cookbook to be published in braille. I have my Great-Aunt Margery’s copy of “Aunt Sammy’s Radio Recipes Revised” from 1931. 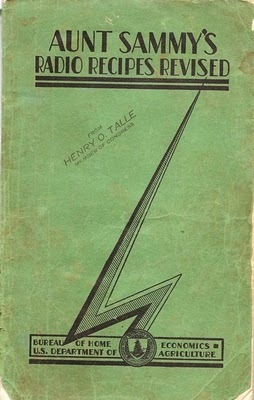 On the cover, there is a stamp that reads “From Henry O. Talle, Member of Congress.” Mr. Talle was a ten-term Republican U. S. Representative from eastern Iowa, where my Aunt Margery lived. It must have been a promotional idea to hand out the cookbook during one of his elections, but if you bought it, the cost was 15 cents. The recipes are all very simple recipes to follow, and also attempt to offer balanced meal ideas. I grew up visiting my Aunt Margery’s home in Wyoming, Iowa. The minute my brothers and I would walk in the door, we went to the kitchen to see what she was cooking or baking. I learned the fine points of basic cooking from Aunt Margery, from her sugar cookies to her chocolate cake. Most of her recipes were probably handed down from her mother, but she also listened to radio shows for recipes. Her favorite was called “The Open Line,” which first aired in Iowa in 1963. I can still see her sitting in her rocking chair and jotting down the recipes she heard on the radio show. She would grab any piece of paper that happened to be sitting next to her and start writing. She even wrote on blank spaces she found in her checkbook! On one visit, I was looking through her recipe file and found one for “Methodist Chicken,” then found another for “Presbyterian Chicken.” I asked her about it, and she said, well, we had to differentiate because the Methodists make better chicken dishes than the Presbyterians – but don’t tell them that! I believe the Open Line is still going strong in Iowa, and I wonder what kind of recipes are being broadcast now. Maybe a Lutheran chicken?